"The Legislative Drafter's Deskbook: A Practical Guide is a masterful work. It is comprehensive and exceptionally well written. It is an essential tool for anyone who drafts legislation or interprets the law." "One of the best features of the book is that the author does not just tell you the rules for drafting legislation, he shows how they work; and, even better, he shows how they can be used to turn an acceptable draft into one that is more organized and precise." "The Legislative Drafter's Deskbook: A Practical Guide is exactly that. It should be a part of every Federal practitioner's library. Even the experienced legislative attorney will find things in the Deskbook that he or she did not know. It is an essential and indispensable book, both as a reference work and as a thorough introduction to Federal legislative drafting." "The Legislative Drafter's Deskbook is an invaluable resource for any legislative drafter working to hone her skills or student seeking to become proficient in legislative drafting. Uniquely among drafting guides, this book demonstrates a sophisticated institutional awareness, devoting substantial attention to statutory methods and techniques that will be used by courts to interpret statutes and to the approach that agencies are likely to take when interpreting or implementing Congress' directives. It is clear that this Deskbook was written by an expert with experience in actual legislative drafting; it carefully analyzes the role of the drafter relative to the policymaker and includes helpful discussions of professional norms and expectations. 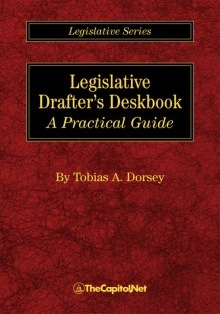 Although the Deskbook is focused on legislative drafting at the federal level, where Tobias Dorsey works in the House of Representative's Office of Legislative Counsel, the succinct and thorough assessment of good legislative drafting techniques provides a set of 'best practices' for drafters at all levels of government." "Dorsey's Legislative Drafter's Deskbook is the perfect companion for both drafters of legislation and students of statutory interpretation. It is a well-written and clear guide to the do's, don'ts and whys of writing effective legislation." "Tobias Dorsey has created a valuable and practical tool for all legislative drafters. He correctly notes that much of the drafter's work involves helping the client think through and clarify the policy choices in the request and he provides clear tips on how to persistently carry out that work. His chapters on writing and organizing bill drafts similarly identify common mistakes and suggest better practices. Dorsey's obvious drafting skills play out on every page of the book, as readers will find solid thinking and clear writing throughout his publication. Although the book has a federal perspective, state legislative drafters will also greatly appreciate this work." "Comprehensive yet still accessible, thorough yet refreshingly clear--Dorsey's new book, the Legislative Drafter's Deskbook, is a stellar reference. If you are drafting federal legislation, you need this book. If you work with legislative drafters, you need this book. Even if you are just interested in the drafting process generally, you will want this book." -- Mary Barnard Ray, Senior Lecturer and Assistant Director of Legal Research and Writing, University of Wisconsin, and author of "Legal Writing: Getting It Right and Getting It Written," "The Basics of Legal Writing," and "Beyond the Basics: A Text for Advanced Legal Writers"
"The Legislative Drafter's Deskbook is essential reading for both professional and occasional legislative drafters. Dorsey's solid experience as a journalist, lawyer, and professional drafter shines through as he delivers scores of vital tips for successful drafting and provides keen insight into how our laws are made and how they are interpreted by the courts. Highly readable and thoroughly enjoyable from cover to cover, Dorsey's deskbook offers practical guidance to the aspiring drafter in not only polishing essential writing skills, but also in asking tough questions, spotting thorny issues, and offering creative solutions that will capture the intended choices of policymakers. If each legislative draft is indeed a puzzle, as Dorsey suggests, he has given us in this book the tools by which we can solve even the most vexing of legislative drafting problems." "Legislative Drafter's Deskbook: A Practical Guide presents legislative scholars, legislation drafters, and quite frankly anyone interested in the construction of statute with a meticulous exploration of the planning and thought processes that must occur in order for clear, understandable laws to be written. Dorsey accomplishes his desired missions of providing practical advice to drafters and interesting insight to scholars (and normal people) on the drafting process." "The Legislative Drafter's Deskbook is my most prized possession in my office. I am constantly highlighting and quoting from the book, and I guard it with my life so nobody walks off with it! We recently went through government reform and transitioned from a tribal council form of government to a three branch system. The Legislative Drafter's Deskbook has been fundamental in establishing our drafting procedures - thank you for this wonderful resource!" "Summing Up: Highly recommended. Lower-division undergraduates through faculty." "This landmark volume on the subject of exclusionary policies against Chinese and Chinese Americans is the culmination of lengthy research conducted while attorney Gold (Senate Procedure and Practice) represented a number of Chinese American groups. Divided into 11 chronologically ordered chapters, the book opens with an exploration of initial Senate debates over exclusionary measures and concludes with details on the repeal of such legislation. Congressional member quotations illuminate period sentiment. An appendix offers primary-source texts, document facsimiles, and discussion questions, and this makes for a valuable teaching tool. VERDICT Expanding on the views in Erika Lee's At America's Gates (2007), this is an exemplary subject reference." "Forbidden Citizens presents a skillful review of the long and tortuous path from temporary to permanent exclusion of the Chinese from immigration and citizenship. It is rich raw material for scholars of race relations and immigration that deftly weaves legal history, congressional debates, regional and national history, and the relation of foreign policy and immigration." "In Forbidden Citizens, Martin Gold offers a sweeping and impressive documentation of the long and shameful legislative history of the mistreatment of the Chinese in this country. Forbidden Citizens is an exhaustive piece of research that will appeal not only to legal scholars and civil rights activists, but to any American curious about this grim chapter of our history." "Forbidden Citizens is a captivating recount of grave and forgotten injustices and efforts to correct them. No one knows more about the United States Congress than Marty Gold, and he engages the reader in a way only he can." "Anti-Chinese violence, discrimination, and rhetoric have a long, sordid history in America. It began with the first Chinese immigrants to North America in the 1840s and in some ways, at least rhetorically, continues to the present day. The anti-Chinese movement often took a federal political form that proved amazingly complex; and for the first time this legal history has been carefully and thoughtfully explained in Forbidden Citizens, from the initial congressional debates in the 1870s, through the passage of no less than nine Chinese exclusion laws, to the eventual repeal of fourteen statutes in 1943. All can be found in this one volume. It is a monumental achievement." An important piece of scholarship, which vividly depicts the intensity of anti-Chinese and anti-Asian feeling that was widespread even among our intellectual and political elite only a century ago." 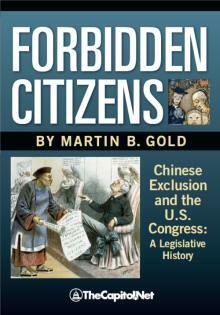 "Martin Gold presents in welcome detail both the disturbing story of how the U.S. Congress came to enact a series of federal laws that singled out Chinese immigrants for discriminatory treatment, and the story of how those laws were repealed. "Beginning with the Chinese Exclusion Act enacted in 1882, these laws were the first time in our nation's history that Congress expressly singled out a group of immigrants for denial of citizenship rights, and for special exclusion under its immigration laws. But, as to the latter course, it was certainly not the last. There is a straight line from the enactment of the exclusion laws to the exclusionary immigration laws of the 1920s that effectively sealed the doors of the United States to Jews who might otherwise have been able to flee the conflagration of Nazi-occupied Europe. "We do well to remember that the protection of the rights of any of us depends on protecting the rights of all. Gold's book is a stirring and timely reminder of that principle." "Martin Gold's exceptional scholarly research on the legislative history of Chinese Exclusion Laws provides a compelling and troubling account of how Congress, a democratic institution of the people, enacted a series of discriminatory laws so contrary to our founding principles. Hopefully, this publication will not only bring to light the historic injustice inflicted on Chinese and Asian Americans because of these laws, but also offer a lesson on why we should not repeat this dark chapter in American history." "When this book was originally written, it bore the title "The Golden Rules of Advocacy," and the previous edition is still available under that name from Amazon.com. I discovered 'Golden Rules' on a trip to England, where I found it on sale at the information desk of the Royal Courts of Justice in London. As a recently retired trial advocate of 32 years experience, I was interested in the English perspective on trial advocacy. I bought the book and read it straight through on the flight home from England and was greatly impressed by Evans' knowledge of the essentials of trial advocacy. When I discovered 'Golden Rules' on Amazon.com, I wrote a glowing review. Then I found 'Common Sense Rules,' and debated ordering it. I rightly suspected it was 'Golden Rules' under another name. After some time, I gave in to the urge to purchase, and I have not regretted it. 'Common Sense' is 'Golden Rules' revised and expanded, and set forth in a much more user-friendly format. I lament the change of title, however. The term 'Golden Rules' conveys the high ethical standard set by the book far better than 'Common Sense'. You can have a head full of 'Common Sense' and still be as crooked as a corkscrew. Despite my preference for the former title, I cannot fault the publisher for the change. Either term is equally applicable. Maybe the third edition could be entitled 'The Golden Rules of Common Sense Advocacy'. Reading this book would profit any advocate of any experience level. Judicious application of the advice contained in the book will make anyone a better advocate." "I can't think of one more effective single thing WSBA could do to advance its skills training goals than to give a copy of CSRA to every newly admitted member. ... CSRA is my desert-island book. And when another lawyer washes ashore, as in a New Yorker cartoon, I'll be ready. Buy this book." "The rules presented are sound and the book is easy to read. It is conducive to being read in short increments, as might well be the case for a busy trial lawyer or for one using it to brush up. I recommend that trial lawyers have this book on their shelves for use as a refresher, in preparation for a trial, or as the basis for daily reflection on trial advocacy." "Down to earth advice for the advocate. Keith Evans' book provides important, down-to-earth advice and guidance for both the novice and experienced advocate. Having adjudicated many, many cases, I wish every advocate would review these practical rules for effective advocacy. All advocates will benefit from this helpful book." "Keith Evans, the author of Common Sense Rules of Advocacy for Lawyers, is an experienced trial lawyer. He has studied the game from the inside and he has seen things others have missed. He has distilled his experience and offers it up in the brisk aphoristic style that brought him his success in the courtroom. The book is a valuable review for the old timers and an excellent primer for those who are starting the climb." "Common Sense Rules of Advocacy for Lawyers is a superb how-to book for the trial lawyer. The author, Keith Evans, walks the reader through the essentials of effective trial advocacy, teaching every step of the way while at the same time never sounding the slightest bit like a lecturer. The scope of the book -- everything from what to wear in the courtroom to writing a trial brief -- is truly impressive, yet the author maintains a tone that is refreshingly readable. The author never loses sight of the underlying rules of evidence, procedure, and ethics, but his real genius is translating those rules into -- as the title says -- common sense rules of advocacy. I wish I had had this book when I was a young lawyer. I highly recommend it." -- Karl Tegland, author, "Courtroom Handbook on Washington Evidence"
"Advocacy is an art as well as a skill, and Keith Evans presents the rules of mastering that art in a very down to earth manner. Filled with humor and eminently readable, his book is a great introduction for the new lawyer and a wonderful learning tool for the advocate with experience." "This is a wonderful 'Bible' for the trial lawyer who wants to win. If only we had had this in law school!" "Not just for lawyers! Common Sense Rules of Advocacy for Lawyers contains valuable insights and practical lessons for anyone who advocates for a living, including mediators, facilitators, and others who may not readily admit to practicing the subtle art of advocacy. Lawyers advocating in ADR settings will also greatly benefit from Keith Evans' book, which is why I recommend it in my Alternative Dispute Resolution course at the University of Colorado School of Law." -- Steve Clymer, J.D., mediator, arbitrator, and facilitator with ACCORD Dispute Resolution Services, Inc.
"This is a remarkable compendium of useful advice presented in a straightforward, entertaining manner. If new advocates could have only one 'how to' book this would be it." "Keith Evans' Common Sense Rules of Advocacy for Lawyers is a delightful and valuable read for trial lawyers and teachers of every level of experience. For the novice, it is like having a seasoned veteran of the courtroom wars as a mentor. It is full of sound advice and useful examples. Barrister Evans will help the greenest litigator look and act competently before a jury. For old war horses and trial advocacy teachers, Evans' list of rules is a valuable checklist of "DO's" and "DON'T's" reminders. Even the most experienced trial lawyer can pick up some new techniques here. I will heartily recommend it to my Trial Advocacy students." "This is a terrific guidebook that should be followed by all young trial lawyers. While it is true that these rules are based upon common sense and that most seasoned trial lawyers will figure them out over time, this book will allow young advocates to benefit from all the painful lessons learned by inexperienced lawyers before them." 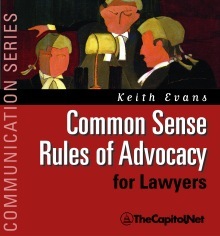 "The latest title in TheCapitol.Net "Communication Series", Common Sense Rules Of Advocacy For Lawyers by author and lawyer Keith Evans focuses upon the advocacy role lawyers have in advancing or defending their client's interests. 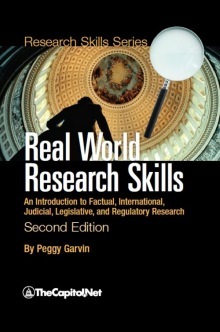 After an informative introduction, specific chapters effectively and accessibly address the dimensions of advocacy; the mandatory rules of advocacy; advocacy as "theater"; the psychology of advocacy; the examination of witnesses; direct examination; cross-examination; re-direct examination; final argument; written advocacy; and advocacy in the age of high technology. Enhanced for the reader with a definitive conclusion, various appendices, and a comprehensive index, Common Sense Rules Of Advocacy For Lawyers is a welcome contribution to professional and law school libraries, and an invaluable candidate for use as a principle curriculum textbook, or at the very least, an important addition to a law student's supplemental reading list." "Bill LaForge has written the perfect resource for anyone who wants to understand the congressional hearings process or who is preparing to testify before Congress. This book opens the door to the world of congressional hearings, and lays out a path to excellence for witnesses testifying on Capitol Hill." "Being called to testify on Capitol Hill can be a career high point or a disaster. Whether your organization is a not-for-profit or a Fortune 100 company, you will want this practical guide by Bill LaForge at the ready when you face one of the most important moments in the life of a citizen." "Testifying Before Congress by Bill LaForge is a gold mine for anyone engaging in the congressional hearings process." "Testifying before congress is a new but increasingly necessary experience for most business leaders. Bill LaForge's book, Testifying Before Congress, is a practical and comprehensive how-to guide that should be required reading before your first experience on the 'hot seat' in front of a congressional committee." "With Testifying Before Congress, Bill LaForge has provided an invaluable and comprehensive resource for law school faculty, students, and researchers interested in gaining an in depth understanding of how congressional committees organize hearings and how witnesses prepare for testimony." 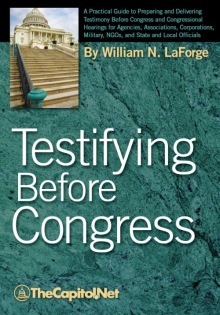 "Bill LaForge's excellent treatise, Testifying Before Congress, is the ideal 'one-stop-shopping,' easy-to-use reference for any witness preparing to testify before Congress. For example, Chapter Four focuses on the details of preparing the witness to testify. It discusses in practical detail the use of prepared materials and witness preparation, including making certain the witness knows what to expect. Every corporate and association executive should have this valuable resource tool available before venturing into the congressional hearings process." "A clear explanation of the workings of the United States government that should be required reading for politically engaged Americans." "An ideal guide, Richard Arenberg leads the way through the labyrinth of congressional procedure. Having staffed in both the House and Senate, crafted legislative tactics, and taught how Congress works, he can explain complex issues lucidly." "It is an effective reference textbook, complete with an extensive index and a clear, helpful glossary of Congress-related terms. Diagrams make more complex processes, like the route of a measure through the House and Senate, more clear and are useful in combination with the prose explanations. Especially valuable are the review questions at the end of each chapter, which are summative without getting bogged down in small details. Two particularly interesting and engaging elements stand out. One is the book’s references to historical figures involved in the creation of Congress. Quotations, such as of James Madison referencing why the Senate was formed, make it easier to trace connections between modern practice and the initial reasons for the government’s development. Secondly, the text effectively addresses polarization, noting the recent trend toward party-based polarization and the lack of collaboration across the aisle. By citing specific points in the process of creating new laws where senators and representatives are collaborating less, the text advances an implicit thesis that Congress is subtly changing its way of operating to favor methods that do not require convincing very many people from opposing parties when working to pass important legislation. Congressional Procedure offers insider-level understanding of how legislation passes through the House and Senate, handling a dry topic with great precision and clarity." "This hands-on practitioner's guide cuts away veils of mystery to shed light on the rules governing Washington's most impenetrable institution, the United States Congress. From 'regular order' to special rules to filibusters, amendment trees, and how the system has broken down in recent years, Professor Arenberg uses his experience and expertise to explain clearly both the how and the why behind the House and Senate and their peculiarly unique ways of doing business. A great guide for navigating the rapids." "Impressively informative, exceptionally well organized and accessibly presented, Congressional Procedure is an especially and unreservedly recommended addition to personal, professional, community, college, and university library Political Science collections and supplemental studies reading lists." "In Congressional Procedure, Richard Arenberg provides the ultimate guide and master blueprint to the legislative process, how Congress should function, and how it operates today. During my 34 years in both the U.S. House and Senate, I witnessed firsthand that process dictates policy, and is central to Congress’s capacity to solve problems. This book is an essential resource and eminently accessible behind-the-scenes look at the machinery of lawmaking." "Professor Richard A. Arenberg’s lively and accessible description about how Congress works is a must read for everyone wanting to know more about the contemporary Congress. It educates scholars and journalists who write about the legislative branch, students, the public, and political practitioners about the inside machinery of congressional procedure. Arenberg’s wisdom about Congress is a combination of years of experience on the Hill and his careful scholarship. It is a thorough and careful account of the organization, processes, and procedures of the House and Senate." "The actual rules of Congress, written and unwritten, are rarely mastered even by the members themselves. All the formalities matter, but so do the folkways that govern their daily application. Arenberg has written a sophisticated and invaluable primer on both. It may take time to be familiar with the ins and outs of Capitol Hill, but Arenberg gives us a great place to begin and an excellent manual to carry with us on the way." "Congressional Procedure delivers on its promise. It is a clear, concise, straightforward guide to how Congress operates. It has just enough detail to explain what is going on without descending into unnecessary minutia. It will serve readers well as either a handy desk reference for members, staff, and anyone else who needs to understand Congress or a textbook for any course on Congress." "Richard Arenberg understands the workings of the Senate as well as anyone I know. Congressional Procedure reflects his wealth of experience, common sense, political savvy, and extensive knowledge of the legislative process." "Richard Arenberg knows Congress from the inside out, from his decades working inside the Senate to his years teaching about it and writing about it. His book, Congressional Procedure, reflects his experience and insights. The title does not do it justice: this book is a primer on all things Congress, a comprehensive and readable guide to what Congress is supposed to do, what it actually does, and why there is sometimes a disconnect." "I wish I had known Richard Arenberg when I was a reporter in Washington. My life would have been easier, my mistakes fewer. As readers of this extraordinary and lovingly executed book will find, Arenberg knows every muscle and sinew of the legislative process: the genius and even the weaknesses of the Congress of the United States. Every reporter, lobbyist, political scientist -- indeed, every citizen -- will gain by reading this fascinating explanation of Congress and how it works and, at times, stumbles." "Congress is both the most important and the least functional branch of our democracy. Few appreciate this more than Richard Arenberg, who spent 34 years on Capitol Hill working for Paul Tsongas, George Mitchell, and Carl Levin. During challenging moments throughout our history, the traditions of Congress have helped to keep dysfunction at bay. In this thorough and accessible work, Richard explains these traditions. If we are to restore the American people's faith in our government, we have to understand what ails the modern Congress. Congressional Procedure is a terrific place to start." "In this comprehensive treatise on Congressional procedure, Richard Arenberg hands us the keys to the lockbox filled with the mysteries of how Congress really operates at all levels. It is superbly written by a long-time Congressional insider who provides us with an education on many levels, yet makes it a practical guide that is useful for professionals, scholars, and casual observers alike. From the Constitutional analysis and explanation of the intricacies and nuances of the legislative process in both houses of Congress, to the description of Senate and House floor procedure, the budget process, and non-legislative functions of Congress, Arenberg covers the waterfront in this must-read for anyone engaged in or studying the legislative processes of Capitol Hill." "The author of the prize-winning book, Defending the Filibuster, celebrates the importance of the rules and traditions of the House and Senate and astutely warns of the dangers of 'weaponizing' procedure in crafting this authoritative source for anyone seeking to grasp Congressional rules." "The Congressional Deskbook is almost too good to be true. The breadth and depth of its coverage of Congress and of the institution's innumerable rules and practices are truly extraordinary. Most importantly, such detail is presented in an exceedingly accessible and efficient fashion. I have no doubt that the Deskbook will become an indispensable teaching tool and reference volume in my teaching and research pursuits." The Congressional Deskbook is perfect for anyone who wants to understand how Congress works. It is concise, clarion clear and comprehensive all at once. It is spare and crisp -- but it never oversimplifies. It is written in lay language, but it never 'dumbs it down.' The Congressional Deskbook is a unique tool, one that I use regularly"
"The Congressional Deskbook puts between two covers what would take most people hundreds of hours to track down separately (let alone decipher). It pulls it all together by using concrete examples and documents to make things easily understandablee--no mean feat given the labyrinthine ways of Congress." "The Congressional Deskbook is the perfect one-stop reference tool for anyone seeking information on the legislative branch of government. 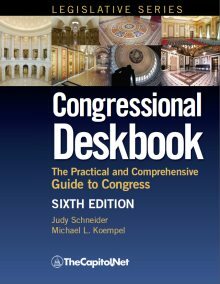 Beyond the valuable information about how Congress works and how bills become laws, the Congressional Deskbook takes the reader inside the Capitol, explaining the customs and power structuree. If you want to know how House and Senate leaders are chosen or if you are searching for a list of those who have lain in state or in Honor in the Capitol Rotunda or how federal spending decisions are made, this reference book has all that plus more." "The Congressional Deskbook is an excellent and user-friendly compilation of helpful information about Congress that provides valuable insight into the legislative processes on Capitol Hill. 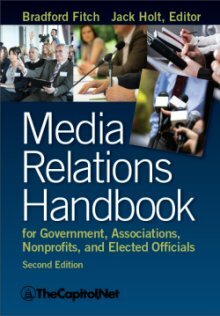 I use it in my government relations practice, and it is required reading in the graduate school course I teach on business representation and lobbying." "An excellent resource for individuals seeking to learn or expand their knowledge of Congress and our system of lawmaking. What's best about the book is that it puts so much valuable information into one place and provides hundreds of additional resources, should the reader desire to learn more." ""Real World Research Skills helps web searchers target their research to some of the most reliable information sources -- government statistics, reports and analysis. It's a great pathfinder through the thickets of federal and state government resources, written in a format that makes it an essential desk book for the serious researcher." "This is an excellent basic resource for anyone in need of government information. It's very well-organized, with a good Scope note that clearly lays out the book's objectives. It includes important basics - how to think before you begin your research; how to work on unfamiliar topics; what to search and how to evaluate the results - which are not always included in books of this type. There's good advice on using advanced search options, understanding Boolean logic, and making a FOIA request, as well as a reminder that not everything is available online and print sources are still important. The layout is clear; charts and boxes make the information easy to find and use. The sections on state and international information are brief, but contain all the essentials. Though this book is aimed at those needing 'basic advice and techniques,' even experienced researchers can find a new resource or a bit of helpful advice. It will prove useful for information professionals, librarians, and anyone who needs to access government information." "The Congressional Operations Poster is the best description of how Congress works in a single poster. 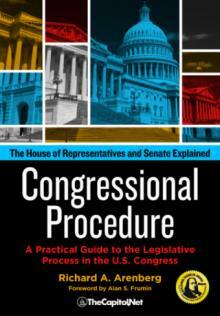 I recommend it to anyone who needs an up-to-date, concise, and thorough depiction of Congress." "Deanna Gelak tells it all, in a comprehensive, straightforward, and easy-to-use book on the art and science of lobbying in the US Capitol. Deanna herself is one of the most highly respected lobbyists in this town: effective, ethical, and enthusiastic. This work is required for all who make their living 'petition(ing) their government for redress and grievances.' It is a clear road map to success in Washington, DC." 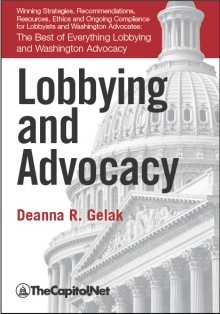 "Lobbying and Advocacy by Deanna Gelak is a great resource for anyone who works in Washington or who wants to know how public policy advocacy really works. Deanna has seen the 'sausage being made' while both working in the Government and lobbying, and her book combines the history and the how-to's of lobbying in one place. This is required reading for students and experienced lobbyists." Lobbying and Advocacy is loaded with practical tips and resources for effective and ethical lobbying on Capitol Hill and in the executive branch. This book is useful whether you are overseeing a government relations function, launching a lobbying effort, building coalitions, or monitoring public policy. While many books discuss lobbying and advocacy, this book concisely highlights the most effective ways to do so. Lobbying and Advocacy is the ultimate lobbyist's handbook." "There are lots of books on lobbying, but, until now, none has provided a comprehensive treatment of what lobbyists do and how they can best do it. Deanna Gelak's Lobbying and Advocacy exhaustively covers the basics of lobbying history, legal framework, congressional processes, and ethics. But the strength of this volume is in its practical advice, checklists, and collection of best practices covering direct advocacy, media relations, grassroots organizing, and coalition building. It is a unique volume and should be on the bookshelf of both beginning lobbyists and senior government relations executives. College and law school professors also now, for the first time, have a single textbook for lobbying courses." "In Lobbying and Advocacy, Deanna Gelak has combined her lobbying experience and extensive research with a vision of open, ethical, and transparent advocacy. The result is a resource sure to empower both lobbyists and citizen activists. This powerful guidebook offers step-by-step instruction for influencing policy, tracking legislation, and holding representatives accountable. Lobbying and Advocacy provides both practical guidance and social and historical context, and is a unique illumination of the mechanisms of power in Washington." "Lobbying and Advocacy by Deanna Gelak is a great primer and a thorough resource, full of good, practical advice. It should be in every association's library." -- Paul W. Hallman, President, MultiState Associates, Inc.
"Lobbying and Advocacy by Deanna Gelak is a comprehensive resource manual on legislative issue advocacy. It is a one-stop resource for both beginners and longtime lobbyists. The coverage is thorough. For example, not only does the book debunk the myth that the term "lobbyist" was coined in the lobby of the Willard Hotel in Washington, DC, it provides examples of specific lobbying efforts and makes them into relevant teaching opportunities. 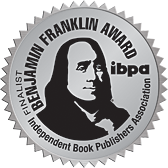 The book also includes pertinent editorial cartoons, primary source data, and relevant historical quotes, hundreds of relevant sources and web addresses for lobbying research on issues, legislators, congressional rules, ethics regulations, potential lobbying vendors and lobbying reporting requirements, making this an incredible lobbying resource. From the U.S. Constitutional background of lobbying to a discussion of the current federal lobbying disclosure regulations, Gelak's book has it all. Every lobbying team will hope their legislative opponents don't have this very effective resource. If you want to gain an advantage for your lobbying team, this book is the one-stop resource necessary to win your advocacy effort." "This book is a gold mine for the new or veteran lobbyist. There is a wealth of tips and strategies on issue research, media, building coalitions and effective lobbying communications. I wish I had this book years ago when I started out as it would have saved me a lot of work and prevented many mistakes." "Lobbying is as American as apple pie. Benjamin Franklin lobbied in London for Pennsylvania and other colonies, and the Constitution recognizes our right 'to petition the government for a redress of grievances.' Deanna Gelak provides in Lobbying and Advocacy an invaluable guide for all citizens interested in exercising this constitutional right." "Lobbying and Advocacy offers an in depth look at the various influences on the government and is a valuable resource for those inside the federal government seeking to understand these influences." "Gibson, a former congressional committee counsel, uses fictional characters to build an accurate and compelling account of many of the problems facing Congress. The thought-provoking changes and solutions he suggests deserve debate, if not implementation." 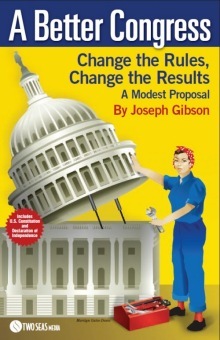 "Joseph Gibson has produced a book that offers real insight into the pressures and problems that underpin modern congressional processes and has offered a series of innovative ideas to deal with those pressures and problems. One need not agree with all of his proposed solutions to get real value from Gibson's book because what he has produced is a template for thinking about new ways to address the dysfunction that pervades Capitol Hill." "In A Better Congress, Joseph Gibson has produced a telling critique of Congress and its inability to perform the job required of it by the Constitution and its constituents. He offers a series of bold proposals to change the way Congress does its work - certain to kick off a complicated, contentious and difficult argument in Washington. Whether you agree or disagree with his solutions, get involved in this vital discussion!" 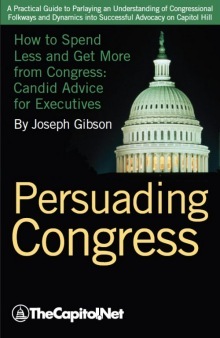 "In A Better Congress Gibson gives us an insider's view of why Congress does not work. Then he shows how changing congressional rules can change congressional results. In 2010, Americans voted for better results. This book shows how we can get them." For rave reviews of our courses, click here.